To say that LeBron James played well on his return to the lineup on Thursday night would be a major understatement. 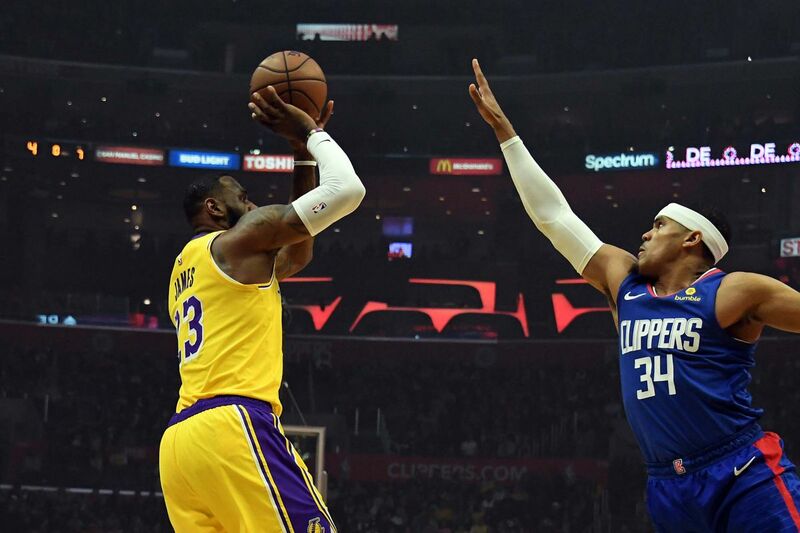 The King, fresh off a 17 game layoff, helped his Lakers win an all-L.A. showdown against the Clippers in overtime by a score of 123-120. He put up 24 points, including the go-ahead bucket to give his team the lead in OT for good, and 14 rebounds in the victory. He ended up with nine assists, one away from a comeback triple-double. Not bad at all, especially for someone that isn’t 100% yet. Another noteworthy game of the night saw the Toronto Raptors host the Milwaukee Bucks, and it will have taught the Canadians a big lesson: come to play from the first tip or it will cost you. Despite a late charge to come from double digits down, the Bucks were just too good defensively with Giannis Antetokounmpo and Brook Lopez down the stretch and they ended up closing it out as 105-92 winners, making it their best start in franchise history. Elsewhere, the Philadelphia 76ers got a big win over the Golden State Warriors to end the Warriors’ 11 game winning streak. The 113-104 win helped spoil Boogie Cousins’ home debut despite seeing Stephen Curry drain 41 points on the night. Joel Embiid was massive for the Sixers, scoring 26 and rebounding almost as many by grabbing 20 boards. Hard to beat a team when you can’t outdo them on the glass. In basketball trade news, the Dallas Mavericks made a big splash on Thursday by trading for Kristaps Porzingis. The huge multi-person trade sees the Mavs pick up another exciting young European star that can help continue the fine work started by Dirk Nowitzki at the team. This all came after Porzingis, apparently, told the New York Knicks that he wanted out of town. It’s a big move, and the Mavs have risked a lot here, but it’s a heady play that someone was always going to make if they didn’t. In baseball transaction news, the San Diego Padres have become a player in the Bryce Harper sweepstakes. The soon-to-be former Washington Nationals outfielder is still yet to sign with a team after a prolonged free agency, and this by the looks of it has allowed the Padres to swoop in and woo the flashy star. It’s been rumored that the Padres are also looking into signing other big name free agents and making trades, so it might not just be the beautiful surroundings that appeal to the slugger. And finally, MLS and American soccer took a big step forward yesterday with the official announcement that Miguel Almiron would be heading to Newcastle United from Atlanta United. The reason it is so massive for the team, the league, and the country is because the amount for him, reported to be around $27 million, is a record fee for an MLS player. If he does well abroad, it bodes well for all MLS teams at getting maximum dollars for their players as well.